We have sixteen members in the School Council and we work together to make our school a better place. Each class has two School Council members who they have voted for. We have regular meetings and discuss ideas and views that are important to our classes. We work hard at making sure everyone’s views and ideas are heard. School Council have been working hard to make playtimes safer for everyone and have agreed to remind everyone about 'no contact' games. They have also been discussing the playground equipment that needs replacing. Mrs Yener is going to contact some companies to get some designs and quotes. Each term the Values Reps will change the last line to fit in with the value we are working on. This year the School Council are raising awareness about keeping safe when crossing roads. We have a zebra crossing on the main road which the children cross everyday. We led an assembly to remind everyone how to cross the road safely and we wrote to parents in our newsletter as well. We received reports from children and many parents told Ms Khan that some drivers were not taking notice of the zebra crossing so we decided to conduct a traffic survey in the morning at 8.15 and in the afternoon at 3pm. There were over 250 cars coming in and going out of Wallingford. We are now writing to Oxfordshire County Council and the Highways dept to see if we can get a pelican crossing put on Station Road. Now that would be perfect to keep everyone safe in the community. Our next job this year is to raise money to get another defibrillator in Wallingford. Cllr Lynda Atkins has put one on our school wall for the community to use and we thought it would be a good idea to raise money for another one, which will be put in the Bullcroft. We are going to have a sponsored run in school to raise money. We need to raise £1000-together we will do it. Since our crossing lady retired two years ago, the different school council members have been working on getting the crossing on the Station Road made safer. 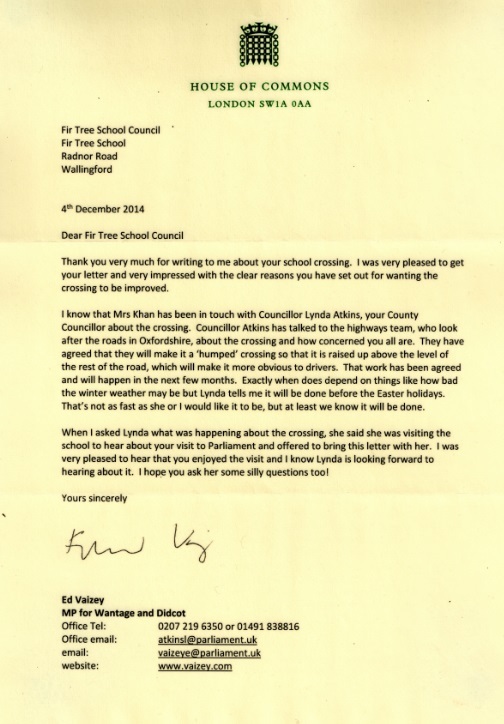 We wrote to Councillor Atkins and Mr Ed Vaizey, our MP and we are happy to tell you that the crossing on the Station Road has been turned into a 'humped' crossing. This is such good news. 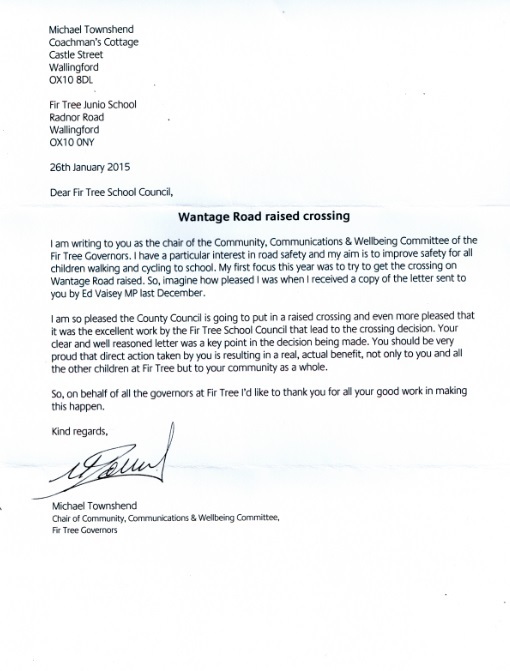 We are so happy that we helped to make the crossing safe for everyone in Wallingford.